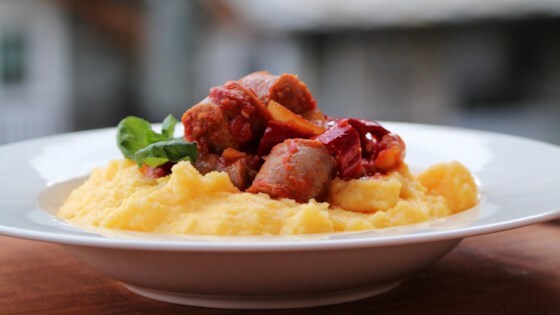 "A delicious medley of hot Italian sausage and peppers is spooned over creamy Parmesan polenta in this satisfying weeknight recipe." Combine chicken stock, half-and-half, and 1 1/2 teaspoon salt in a large saucepan; cover and bring to a boil. Whisk in polenta. Reduce heat to low; cook, whisking often, until polenta is soft, about 15 minutes. Heat olive oil in a large skillet over high heat. Add sausage links; cook, turning often, until browned on all sides, about 6 minutes. Transfer to a plate. Stir remaining 1 teaspoon salt, red bell pepper, yellow bell pepper, red onion, and oregano into the skillet. Cook over medium heat, stirring often, until onion is translucent, about 6 minutes. Add garlic; cook and stir for 1 minute. Reduce heat to low; pour in white wine. Stir in marinara sauce. Slice sausages and return to the skillet. Cook, covered, until no longer pink in the center, about 3 minutes. Stir 1/2 cup Parmesan cheese and butter into polenta until melted. Season with black pepper. Divide polenta among 4 serving plates. Top with sausage and pepper mixture. Garnish with remaining 1/4 cup Parmesan cheese and basil. I used a homemade chicken sausage with sun dried tomatoes, doubled the peppers and omitted the marinara. Delicious and quick! We did love it. It was the first time we tried Polenta too. Great recipe and filling ! Awesome! We used precooked polenta (minus the extra cream and butter) and It was still delicious. I don’t think you can go wrong with this one.